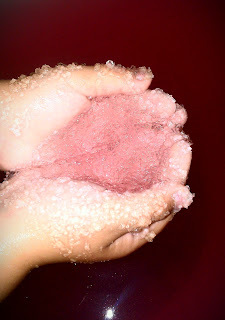 Being Frugal and Making It Work: Squish Baff: Turn Your Childs Bath Water Into Goo! Squish Baff: Turn Your Childs Bath Water Into Goo! My daughter is eight years old and always ask for the new, fun, cool things that she sees on television commercials. Whether it be a new toy, a fun food, or a cool destination - my daughter wants to have it or go there. A few months ago, she asked for Squishy Baff! My immediate response was, NO WAY! My mind instantly thought of clogged drains and stained bathtubs. As a mother, I was thinking of all the bad things that might happen, but my daughter was only thinking about how fun it would be! So, when I was contacted to review Squishy Baff, I decided to give it a try. After all, I am the one always telling my children that they can't say they don't like something if they haven't tried it. My daughter couldn't wait to get into the bath and experience Squishy Baff for herself. Did she like it? She had a BLAST! She kept telling me how cool it felt between her fingers and her toes. She was laughing and having so much fun. She was in the tub for almost an hour, she didn't want to get out. Of course, my son and I had to see what the fuss was all about. We kneeled outside the tub and the fun began! It felt so gooey, squishy and weird - but cool at the same time! Squishy Baff would be perfect for parties, pools, bath time, or a rainy day activity. Have you ever been to Halloween party where you were blind-folded and had to guess what you were sticking your hands in? This would be ideal! Did it stain our bathtub? No! Did it clog the drain? No! Did it irritate our skin? No! Squishy Baff turns ordinary water into glorious colorful goo and then back again. Create fun goo adventures, while feeling it squishing between your fingers and toes! It's safe, fun, and doesn't leave stains or residue. When you are done playing, simply add the dissolving powder and watch it go down the drain! Squishy Baff also comes in four great colors: pink, blue, red and green. 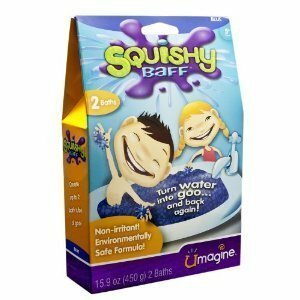 Have you tried Squishy Baff? It sounds like fun but I haven't tried it yet!! That sounds like lots of fun. Not sure it would be the cleanest bath, but it sure sounds like fun. Would be great for a party to play in too (like in a tub outside). My daughter has Down syndrome and we are always on the hunt for things that have unique/new textures to expose her to them. We may have to look into this one - I think she'd love it! My daughter is always asking me for this stuff, but I'm not a fan of chemicals and dyes in their bath water.